For many people living with autism, it takes years to carve a place in life where they can thrive. But for Matt Kaiser (pictured), it took more than three decades for the diagnosis to come. Finding his niche was a much simpler journey. "I've found that when I perform on stage, I'm a different person than when I'm not performing," said Kaiser, who has found his passion as a comedian since being diagnosed with Asperger syndrome, a type of autism. "When I'm not performing, I tend to be a little bit off to the side and to myself, and that's kind of gotten me in trouble. … A lot of people were misconceiving me in every way possible. Being in the dark for 35 years, I didn't know why." It wasn't discovered that Kaiser, 39, had Asperger syndrome until he was 35. 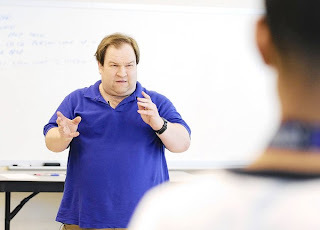 Since then, the Towson University graduate has honed his comedic skills and recently began teaching them to others in a new program at Towson's Hussman Center for Adults with Autism. His goal is to open doors of self-discovery for others who live with autism. Autism is a developmental disorder that appears early in life, and affects the brain's normal development of social and communication skills. The effects of autism are different for each person with it. Though symptoms can include cognitive and physical impairments, people living with autism also typically excel at something. The comedy program, which began in March, has eight registered participants and meets once a week in the center's space at the newly renovated Towson City Center. There, too, the Catonsville resident is far from the man who used to stand on the periphery. "I'm just a different person when I'm performing — same goes with when I'm conducting a class or a workshop like this," he said. "I'm, in essence, in performance mode." On Tuesday, April 9, the third meeting of the workshop, Kaiser worked with participants, many of whom are in their 20s, along with university student mentors on improvisation games using props. The participants brought their own props and acted out scenes with creative uses for each. Before the session started, the participants stood apart from each other and didn't interact much. But as the program progressed, connections were made and smiles grew. Since the program began, Rhonda Greenhaw, director of the Hussman Center, said she's seen the participants open up and connect with their "artistic selves." "For so many of the participants, for their whole life they've been told to do things differently," Greenhaw said. "Initially, they feel like … they can't even connect" to what they were watching. "They can't even connect to something unique and original. They want somebody to tell them, 'What should I do?' Just by providing them with a safe and supportive environment, we've really seen people break out of that, to really connect with it," she said. As she has seen with participants in the center's other programs, it has taken a while for some of them to open up in a more structured setting. "A lot of our participants come ... to our programs with this mistrust and this sense that, "Oh, I'm going to come to another place and be told that I need to change, and how much work I need to do and how many deficits I have.' " Greenhaw said. "This is very different. This is all about your strengths and connecting to yourself and using those things to really come into your own, and I think that's really meaningful." That they're taking their cues from someone who, despite not being diagnosed with autism until his mid-30s, can relate to them and shares their experiences of feeling different from those around them. Kaiser found his niche while in the acting program at Towson University, which he graduated from in 2010. He said some aspects of the program weren't clicking for him, but then an instructor who saw him thrive in mime and movement classes suggested he take a techniques in comedy class. "Of course, I did, and suddenly everything was clicking into place," Kaiser said. Now, his repertoire includes the mime, physical comedy, improv, standup and prop work he learned in that class. He's taken three classes at the famed Second City Improv Theater in Chicago, and hones his craft at comedy shows and workshops in the Baltimore/Washington area. He got plenty of laughs from the participants on Tuesday. After teaching them to use the props, he put on his own prop routine using a collapsible neon yellow tube. He flopped around the floor and used the tube as an elephant trunk, inchworm, a snorkel and Groucho Marx' cigar. He invited participants to show their own ideas during his display. During the participant's prop routines, he was empathetic and supportive, encouraging applause and pointing out their particularly clever uses of the items. He participated with the previous incarnation of the Adults with Autism program on campus, before it moved to Towson City Center. After attending a couple of events, he and Greenhaw established a program for him to teach his passion to others on the autism spectrum. He worked with his job coach, Susan Howarth, on a proposal for a weekly program, and although all parties were apprehensive before the first class, Kaiser was a natural teacher and Howarth has been thrilled to see him thrive in the setting. "One of the reasons I think he wanted to do this was he wanted to help other autistic people learn other communication modes where they're comfortable," she said. "For me to watch him in this situation — it's just so cool."